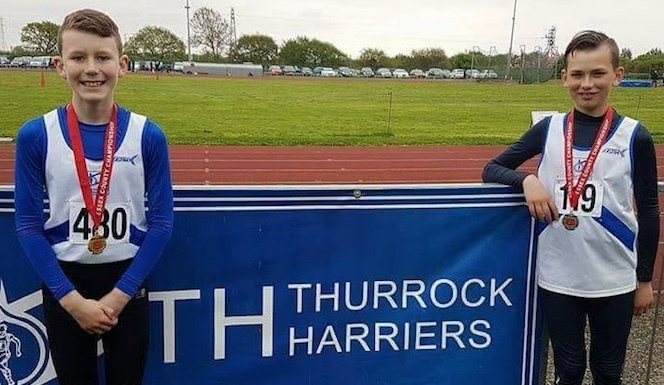 THURROCK Harriers were well represented at the Essex County Pentathlon Championships on Saturday (28th). Competing against athletes from across the county Thurrock won a total of three Gold, three Silver and three Bronze medals as well as a host of personal bests. 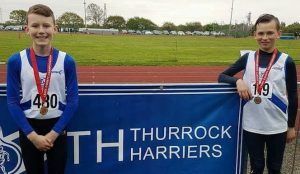 The U20s competition saw Liam Chivers win Bronze with a pent pb of 2211 and Jess Whitbread, after a two year break from Combined events, win Silver with a pb of 1634. In the U17s Theo Adesina won Gold with a pb of 2656 and was joined on the podium of Daniel Ogutuga who took Bronze with 1775 points. Ruby Bridger won Gold for the girls with 3183 points, Ruby’ s 80mH in 11.69s equalled the club hurdle record for U17W. U15W Tilly Monk’s pb of 2390 points saw her take Bronze home. In the U13s competition Jack Warren won Gold with a pb of 1181 with Maison Carpenter-Prout in Silver position with pb of 1171. Rosie Townley won Silver with a pb of 1826.